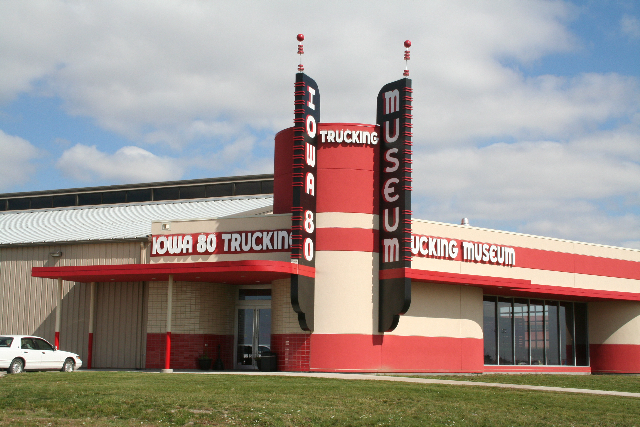 Iowa 80 Trucking Museum: A great free attraction. Check out “world’s largest truck stop” too! Iowa 80 Trucking Museum, located at the Walcott interchange along Interstate 80, offers a large display of antique trucks and is free. Phil Roberts photo. 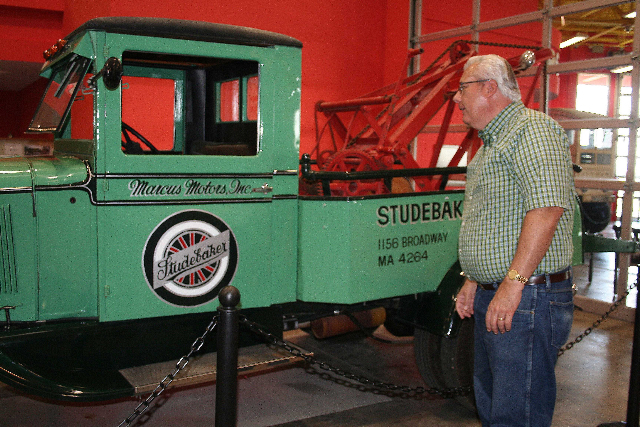 Rod Denze of Davenport checks out a 1930 Studebaker tow truck. Phil Roberts photo. 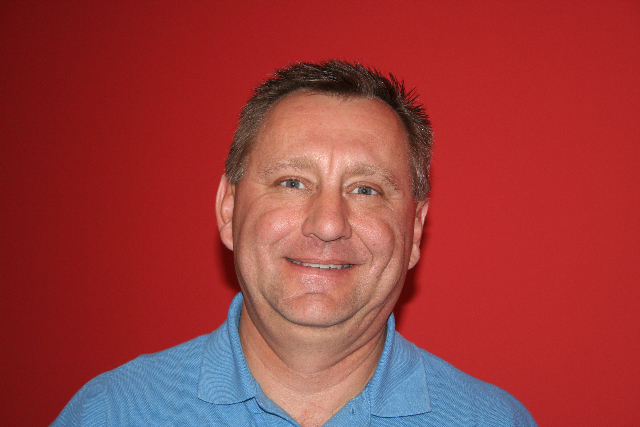 Dave Meier, curator of the Iowa 80 Trucking Museum. Phil Roberts photo. It’s free, making it one of the greatest tourism bargains in eastern Iowa and western Illinois. The Iowa 80 Trucking Museum (iowa80truckingmuseum.com) sits just a few miles west of Davenport at the Walcott interchange, mile marker 284, along Interstate 80. And it’s a fine place for motorists on fall folliage-viewing excursions to learn a thing or two about trucking history while taking a break from the road. The non-profit facility, located just north of Iowa 80 Truckstop, the world’s largest truck stop, was a dream of the truck stop’s founder, the late Bill Moon. It features a huge display of antique trucks and trucking memorabilia. Many of the trucks displayed — from 30 to 35 at a time, depending on their size — are one-of-a-kind vehicles. Most are from Mr. Moon’s collection and were acquired before his death in 1992. Other trucks at the museum were donated or are on loan. “I love it,” Rod Denze of Davenport says while making his first visit there. That’s how most visitors react, according to Mr. Moon’s son-in-law, Dave Meier, museum curator. The museum entrance, off of County Road Y-40, is marked by a sign. A short road leads to a paved parking lot right outside the door of a new 5,000-square-foot visitor center. Inside are restrooms; a gift store; several antique trucks, including a 1934 GMC tractor and trailer; a display of antique gas pumps; and the REO Theatre, which features short films on trucking history. “We always have a movie going, and we offer those for sale in the gift shop, too,” Mr. Meier says. During a recent stroll through the museum, he spoke of the GMC. “Today, none of us would even consider taking that truck to Davenport,” he says. The visitor center also boasts a new exhibit on vintage electric trucks. The centerpiece is a 1911 Walker electric that was a commercial milk delivery truck. Four rows of additional antique trucks and other displays are found in an adjoining 14,400-square-foot exhibit hall. Sometimes the pair came back with an antique truck to restore, and sometimes they came back empty handed. When Mr. Moon died, he owned 60 to 65 trucks. Others have been added since then. Mr. Meier says the trucks on display and those in storage are rotated once or twice per year. He says every old truck has a story to tell and those stories are documented on large signs displayed with each truck. “This truck has had a hard working life,” says Mr. Meier, pointing to the large, steel frame rails on a rare Velie, which was manufactured in Moline. Thick beads of weld mark several places where cracks in the frame have been repaired over the years. Admission: Free but a donation is appreciated. Hours: Open 10 a.m. to 6 p.m. Wednesdays through Saturdays and noon to 5 p.m. Sundays. Closed Mondays and Tuesdays. Location: 505 Sterling Drive, Walcott, Iowa 52773. Phone (563) 468-5500. The museum is just north of Iowa 80 Truckstop at the 284 interchange of Interstate 80. Iowa 80 Truckstop is billed as the world’s largest truck stop. Iowa 80 offers the usual products and services travelers want: fuel, restrooms, snacks, a service center and a restaurant. But there’s lot more, too, including a food court with half a dozen fast-food restaurants, a Truckomat truck wash, a CAT scale, a Verizon Wireless kiosk and a 50,000-item store who highlights are gifts and chrome items. There’s more. Iowa 80 Truckstop has a library and the services of a barber, dentist and chiropractor. Copyright 2009 by Phil Roberts, Creative Enterprises. These stories were printed in October in the The Dispatch, Moline, Ill., and The Rock Island (Ill.) Argus. What? All this and we didn’t go? Next time, for sure!